A Multiple Launch Rocket System (MLRS) Automated Tactical Data Systems Specialist is an important part of the Army's combat team. 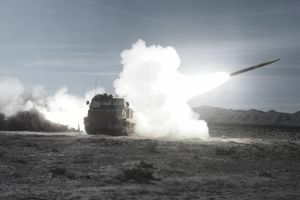 MLRS teams are used to support infantry and tank units while supplementing cannon artillery in combat, but they also have responsibilities during peacetime. The MLRS launches various missiles and ammunitions in quick strikes during combat. The MLRS Automated Tactical Data Systems Specialist records and transmits the firing data for the MLRS. Records and transmits firing data using the fire direction system and voice radio. Operates fire direction systems, Platoon Leaders Digital Message Device, and Multiple Launch Rocket System communications equipment. Participates in gathering of operations and intelligence data. Plots using fire capability charts and friendly and enemy situation maps. Records ammunition expenditure, equipment serviceability, situation, firing point, target, and mission reports. Drives section vehicles, performs operator/crew maintenance on section vehicles, generators, and equipment. Aids in collection and transmission of data. Installs, maintains, and operates radio wire communications, digital communications devices, and secure voice equipment. Assists in leading and directing fire direction personnel. Leads MOS 13P soldiers in MLRS Platoon FDC. Plots information using firing capabilities chart, friendly and enemy situation maps. Operates fire direction systems, platoon leaders digital message device, and multiple launch rocket system communications equipment. Converts fire orders to fire command. Job training for fire direction specialist requires 10 weeks of Basic Combat Training and seven weeks of Advanced Individual Training with on-the-job instruction. Part of this time is spent in the classroom and in the field under simulated combat conditions. Some of the skills you’ll learn are: Calculating target locations manually and electronically, plotting points using different types of maps, operating communication systems specifically and artillery tactics and battle strategy. There is no civilian occupation that is directly equivalent to MOS 13P. However, the following civilian occupations make use of the skills developed through MOS 13P training and experience.